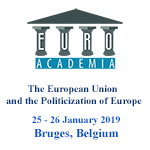 The subject of my paper is the populist political discourse about European integration within the parliamentary Committees of the Member States. The member states on which I have conducted my analysis are Italy, Austria, and the Netherlands. As selection criterion, I used Arend Lijphart’s classification that puts them in the category of consociational democracies. The period of analysis of the speeches includes the end of the last legislatures and the beginning of the current ones. The parties that I have analysed are the 5 Star Movement and the League in Italy, the Austrian Freedom Party, and the Dutch Party for Freedom. In detail, I dealt with the parliamentarians of the Committees relevant to the European themes and the members of governments based on a coalition of populist parties who were summoned in the Committees. The positions of parliamentarians were inquired on the following topics: deepening of European integration in economic and social issues, enlargement, defence, and immigration. The sources of the article are the stenographic reports of the parliamentary committees present on the institutional sites of the parliaments. The present work demonstrates the complexity of the European integration discourse and the contradictions present in the single parties and coalitions, the diversity of approaches between the forces of the different states, and the weight of national interests on populists’ political claims.